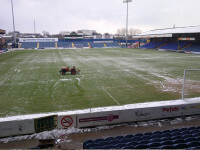 For a life-long Hatters fan - not that, at twenty-three years old, he's up for a long service medal just yet - being offered Stockport County's Head Groundsman role was one that Liam Cash could simply not turn down. When talking about 'noisy neighbours' Stockport County can probably claim to have the loudest, with the Manchester's United and City just seven miles away. 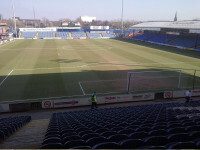 The club currently play in the Blue Square Bet Premiership, and are the longest serving Football League side to have dropped out of the top divisions, having played in the league for a total of 110 consecutive years. Liam Cash actually began his career at the club back in 2008 working under the then Head Groundsman, Lee Horton. 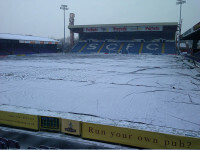 "I've seen the pitch at its very best and its very worse! The pitch, back then, was being shared by the football club and the Sale Sharks rugby union side and it simply didn't have the foundations needed to deal with both sports," says Liam. "Over the years the club have added new drains and sampled new materials and I thought, as a result, last year the pitch dealt with the dual sports the best it ever has. We all certainly learned a lot!" "I worked under Lee until he emigrated to New Zealand just over a year ago. I have a huge amount of respect for him and he taught me an awful lot. As I say, at the time, we had a lot to adapt to with both sports and a lot of challenges thrown at us." In May 2010, Liam left the club to join Premier League outfit Aston Villa. "I worked both at Villa Park and the club's training ground, which is where I spent most of my time. Going from Stockport County to Aston Villa was huge for me, both the standard of the pitches and the levels they work to were all new to me and something I will always keep with me." 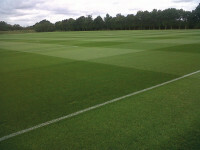 "I learned a lot from their head groundsman, Jonathan Calderwood, and the other lads there in a short period of time. It's a great place to work and I would recommend to any young groundsman who has the opportunity to work at Villa to take it all in and enjoy every minute of it. Just walking out on a stadium pitch such as Villa Park was unbelievable for a twenty year old, but to be actually working on it was great." 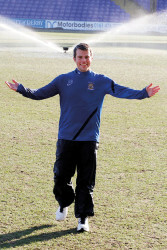 Having rejoined the staff at Stockport County for ten months, and amidst uncertainty regarding staffing levels, Liam departed again, this time to join the Manchester City groundstaff. "My first game at City was at the end of last season against QPR - yes the 'AGUEROOOO' one - so it was an unbelievable start for me. I was based at the academy site, working under Steve Malone and Roy Rigby and, again, I gained a huge amount of knowledge and confidence from those two, and from Lee Jackson (stadium) and Lee Metcalfe (Carrington)." "It's a great crew at Man City and the plans they have for their new training ground really are something that, in my opinion, will set the standard around the world." "I worked on various and different surfaces, such as Fibresand and Desso, and was thoroughly enjoying my work but, when the call came from the club I support to become their Head Groundsman, I knew it was something I had to seriously consider. I can tell you, it wasn't an easy decision." "I've only been back here since late December, so it's just been a case of managing the pitch the best I can, getting games on and getting the most out of the pitch until the end of the season." Liam's first challenge was a double header against Hyde FC on Boxing Day, followed by the visit of Telford United on the 29th December. With two games in just four days Liam told the club officials; "I have examined the pitch the best I can over the last few days and I'm happy with its condition, despite the weather!" The Hatters pitch is a Fibresand construction, but even that had struggled with the amount of football and rugby fixtures and the run of poor winters. "There was never any time between games to do any meaningful work on the pitch," says Liam. 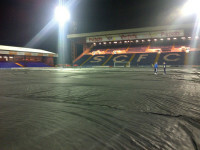 "All we could do was repair it as best we could, mark out for the changeover and put the relevant goal posts up!" So, when Sale Sharks moved to their new home at the Salford City Stadium in April 2012, it was a double edged sword; the pitch would improve, but the lost revenue would be of concern. "Whilst the Sale Sharks were here we always had quite sufficient renovations. We'd Koro off the top 15mm, turnover of the soils, top up the Fibresand levels and cultivate in with an application of pre-seed and then add around twenty bags of Johnsons Premier seed." In 2010, the club financed new drainage - 110mm main drains, 80mm lateral drains at 5m and 50mm and sand slits at 1m and, partly as a result, we haven't had a game of rugby or football called off since. 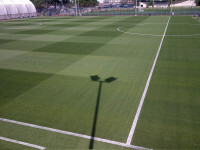 The pitch has a full irrigation system in place, with fifteen sprinkler heads spread across the pitch and perimeters, and is capable of being programmed to water the pitch throughout the day and night. "At the moment I work alone on the stadium pitch," says Liam, "although I have recently acquired some help on matchdays with divoting etc. The wear and tear has obviously been less this season now that the stadium only hosts football. We have the usual amount of home first team fixtures of twenty-five, plus around thirty first team training sessions and eight reserve team fixtures so, as much as we haven't had the vicious tearing of the surface that rugby union gives, we have still had a significant amount of hours use on the pitch. No more than anywhere else though." "Obviously, during these winter months, mowing has only taken place a couple of times a week. Brushing up of debris with a Dennis G860 mower and dragbrushing has been regular since I returned. I applied a Sierrablen 15:0:28 in early January, 7:0:14 at the end of January, an application of GoGreen Plus and Salute WSP in mid February and a 4:0:8 granular feed at the end of February. The pitch has been verti-drained four times throughout the season and, since December, I have put the Procore over the surface five times." "As for equipment, I think I'm pretty well covered. I have a Dennis G860 mower, a Toro Procore, Kubota tractor, Scotts fertiliser spreader, a wheel to wheel line marker and a tractor mounted sprayer. In the coming weeks I will hopefully be getting two new rotary mowers and another Dennis G860." "I'm currently planning my end of season renovation and am obtaining quotes for two passes with the Koro, a full turnover of soils, 100 tonne 0.9% Fibresand added and cultivated in, seed preparation, pre-seed and a full seed and sow." Whilst being a young man, the experience Liam gained at Aston Villa and Manchester City will hold him in good stead as he strives to provide a pitch that will help his beloved team return to the Football League.